While I was recently away at the SNAP conference, my mom wanted to make a special treat out of some storebought cinnamon rolls- like the Cinnamon Roll Cakepops she saw on my friend Kimberley’s blog. As luck would have it, she didn’t get around to making them while I was gone, and we tried to come up with something fun to make with the dough- when it hit me- make Cinnamon Roll Doughnuts!! 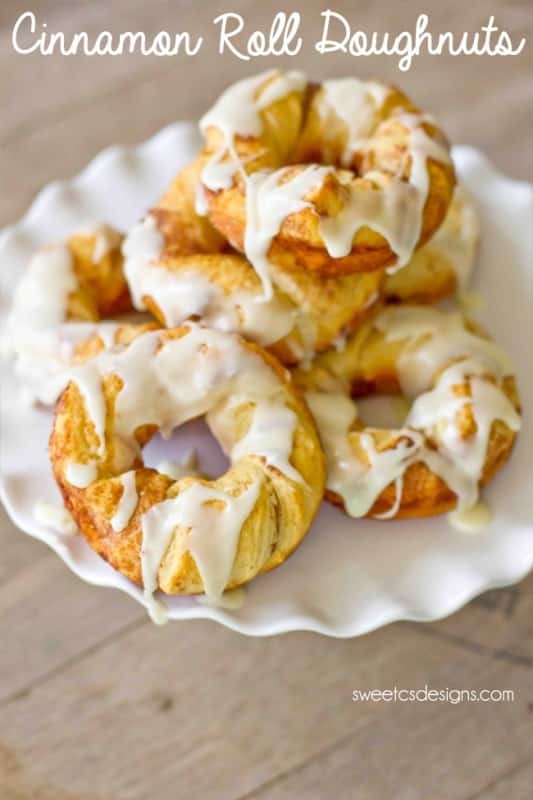 These Cinnamon Roll Doughnuts are easy, quick and take under 10 minutes. They get crispy, crunchy, and pull out more cinnamon flavor with sinful caramelized sugar and rich butter overtones. 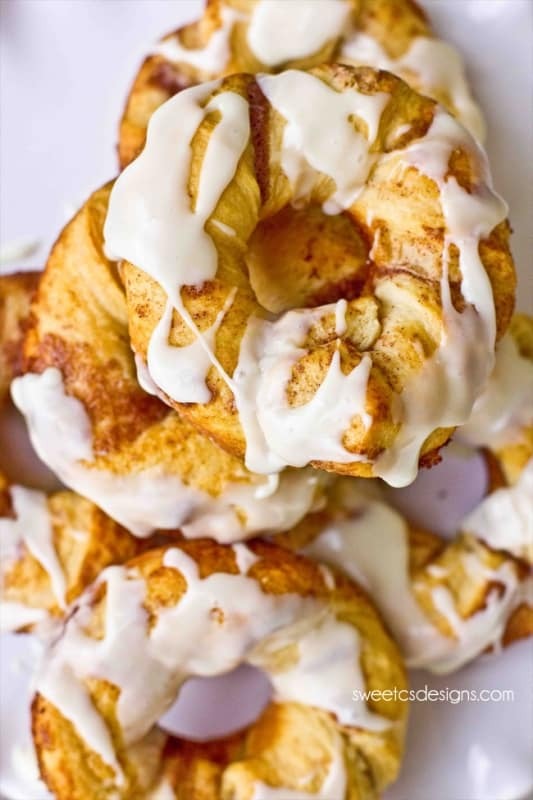 I’m using Pillsbury storebought cinnamon rolls and a Wilton doughnut pan to make these little bites of heaven completely fantastic! Spray a VERY generous coating of Wilton’s cake release spray (this is the BEST cooking spray around. Really- toss out any others you have because this beats any other spray I have ever used, hands down) and unroll your cinnamon rolls. Give them a gentle twist and lay them in the doughnut pan, pinching the ends together. Bake at 350 until golden brown- about 8 minutes depending on your oven. Drizzle with icing, and enjoy!!! If you let the icing melt a bit and ice the doughnuts when completely cool, the icing will set on the doughnut and not rub off all over your hands. I like warm doughnuts, so this tip doesn’t work for me- but if you are serving them at a breakfast/brunch party where people will be walking around, it is great to prepare them this way so your guests don’t have a big old mess – kind of like using my storebought icing faux fondant trick on cupcakes.